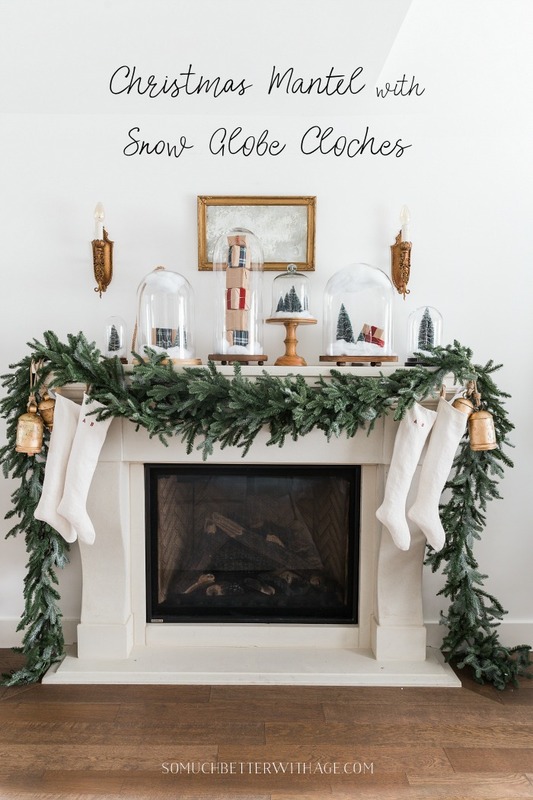 Visit all the Christmas mantel decorating ideas along with my mantel decorated with snow globe cloches. 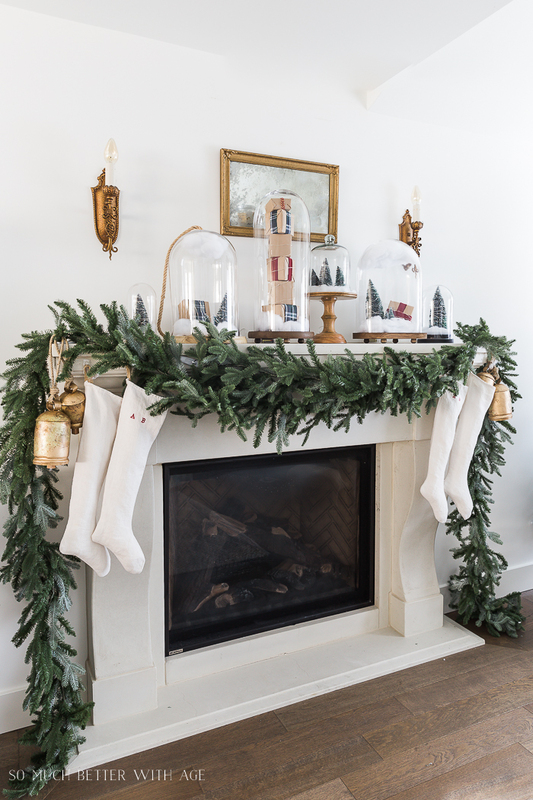 I used my cloche collection this year when decorating for fall and Halloween so I thought I’d carry on and decorate my mantel for Christmas with them too. 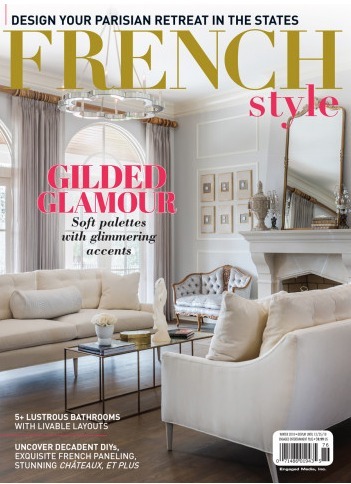 It’s the perfect fit as the cloches look just like giant snow globes! 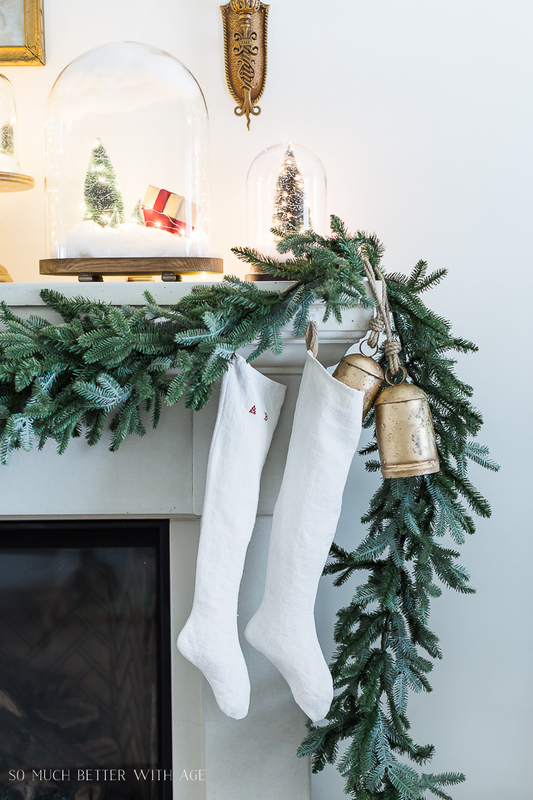 Today I’m joining 26 talented blogger friends sharing our holiday mantels or vignettes hosted by my friend Krista from The Happy Housie. Be sure to visit all the tours at the end of this post. To make these cloches look like large snow globes, I added buffalo snow (not the flake kind but the kind that’s like cotton batten) to the base. Then I added bottle brush trees and pushed the base through the buffalo snow. 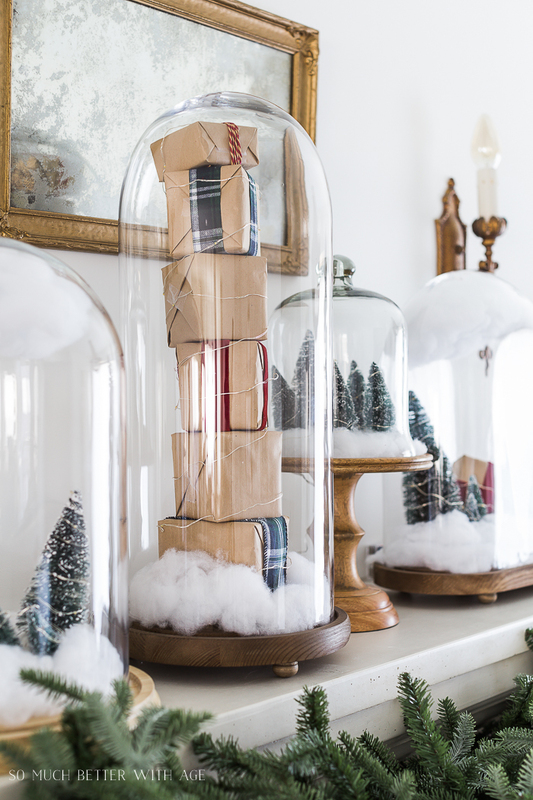 In some of the cloches, I added wrapped boxes and added red velvet and plaid ribbon to them. The last step was wrapping the gifts and trees with LED string lights on wire to get the full Christmas effect. In two of the large cloches, I added buffalo snow to the very top to look like clouds. 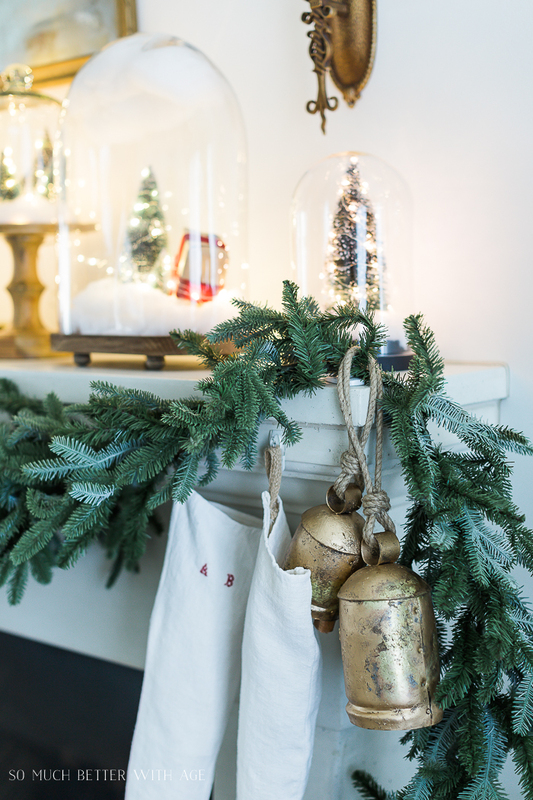 I bought two sets of these brass cow bells last year and I was so excited to use them this year. The stockings I made a couple of years ago. You can download the sewing pattern here. They look so pretty all lit up! I hope this has inspired you this season. Be sure to visit all the other tours! 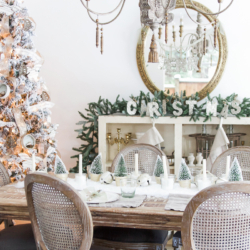 Aaah all those cloches and snow globes, love!! 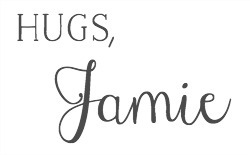 Such a clever idea, Jamie! 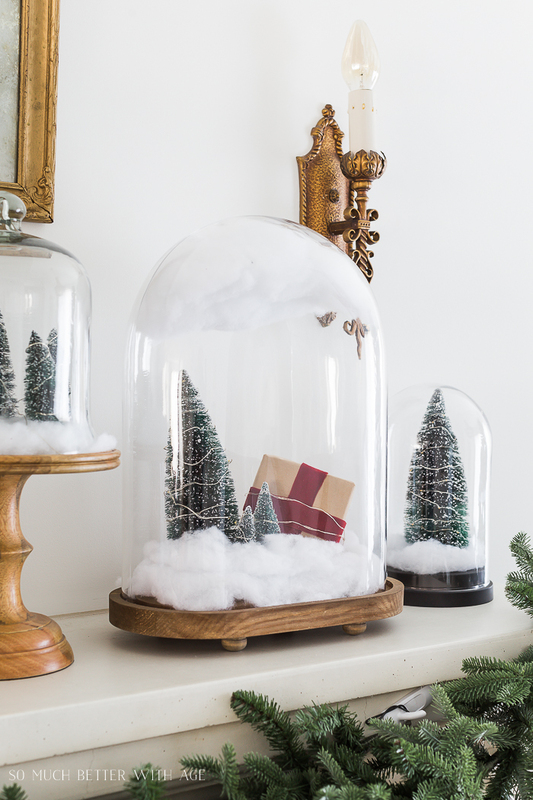 Love the DIY snow globes! 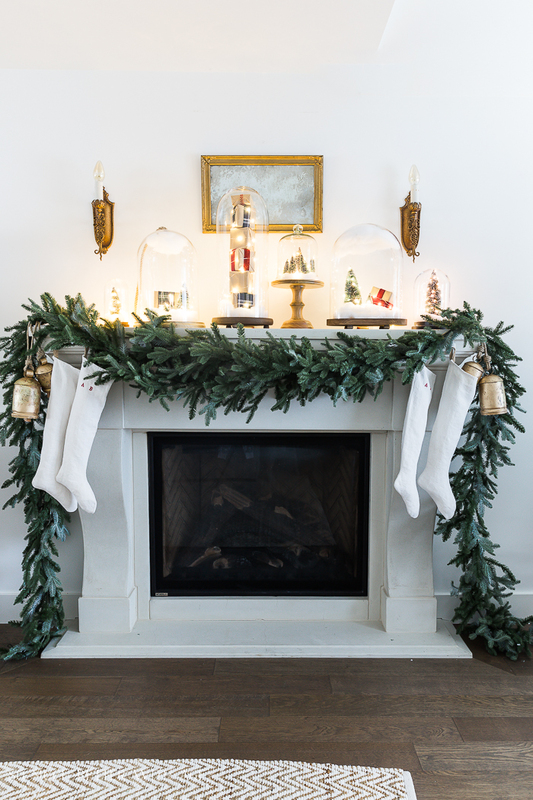 The mantel is so pretty with the different cloches. How did you get the cotton to stick to the tops of the glass globes? I just added double sided tape to a bunch of buffalo snow. Jamie Your snow globes are darling. 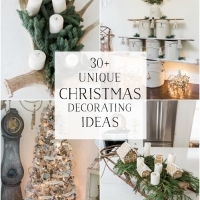 This is so creative and I am in love with the bells! Thanks Rhonda. I love those bells too! 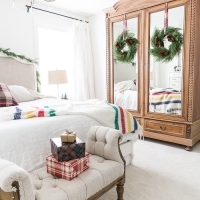 Your pictures are amazing, love the decor! 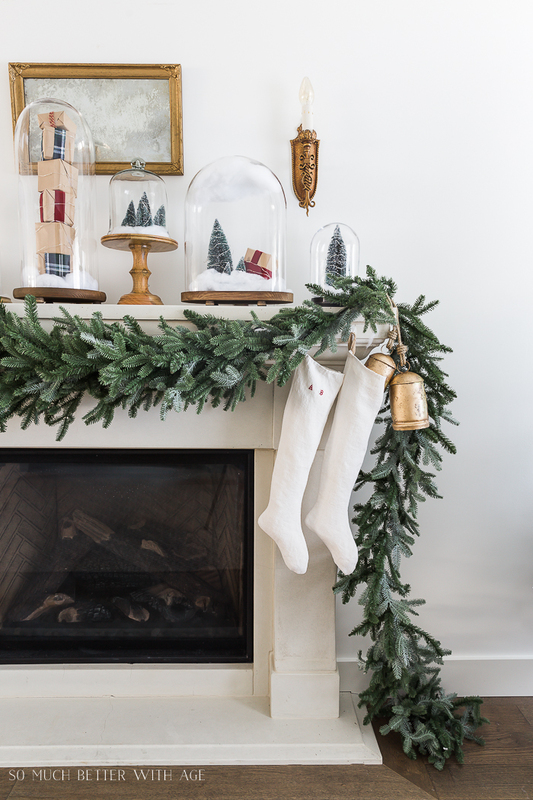 Your fireplace is so stunning every year! 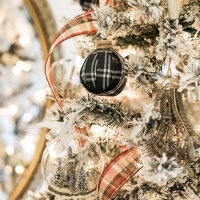 I love the traditional look of the plaid papers and garland! So, pretty, Jamie! Aww, thanks April! 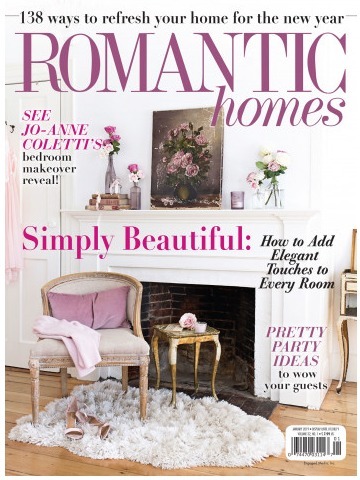 I always love your mantel decor too. This is so sweet and romantic. LOVE how it looks. So beautiful and I love the bells at either side. 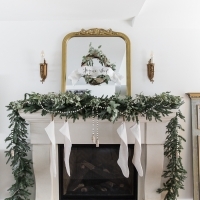 Thank you for sharing your gorgeous mantel and being a part of the blog hop. 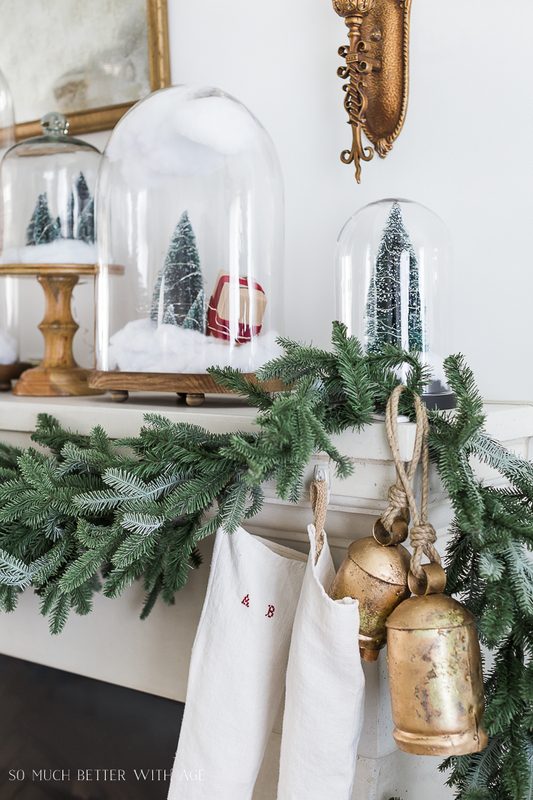 They do look like snow globes and as you have shown us from holiday’s past, how versatile cloches are. Thanks Krista and thank you so much for having me on your beautiful tour! Thanks Laura! I love them too! Your mantel is beautiful and the snow globes was a genius idea. So beautiful and romantic. I love it. 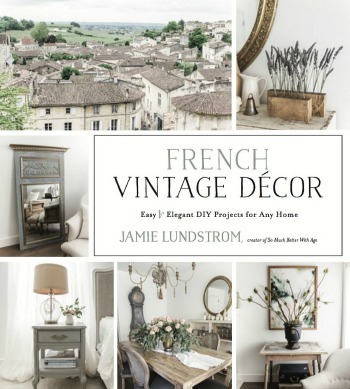 I love how you’ve been changing out your cloche collection for the seasons, Jamie! 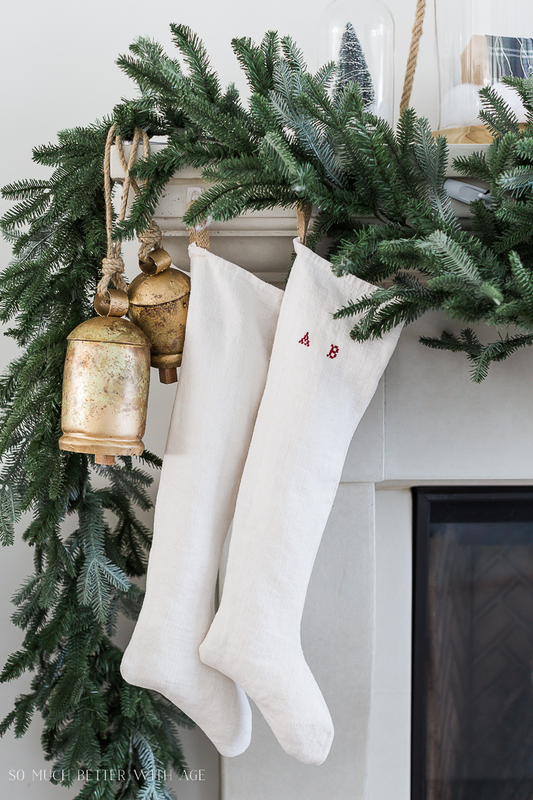 They make such a great statement on your mantel! Beautifully done! Hope you’re having a wonderful week! 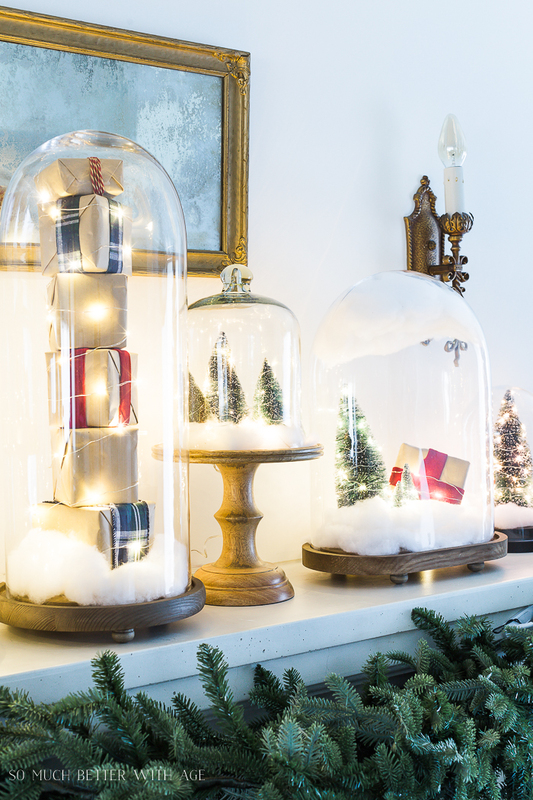 I love your snow globe cloches, such a clever idea!